This has become my new favorite Korean dish. With so much flavor and versatility, you can make this marinated pork dish as spicy (or not) as you like and add various veggies. I like to add bean sprouts, shredded carrots, small pieces of broccoli and spinach (none of which are called for in the recipe below from crazykoreancooking.com. Serve it over rice and with kimchi (a fermented spicy cabbage) if you'd like. I think the keys to this dish are the toasted sesame oil, fresh ginger and garlic and the red chili paste (which you can buy at most Asian markets or even some regular grocery stores). Also, slicing the pork thinly (easiest to do when partially frozen) and marinating it help bring out the flavor and keep the meat tender. This is another favorite Korean dish made of marinated beef in a savory sauce with a bit of sweetness. Slice the beef thinly (easiest to do when partially frozen) and marinate it if possible for at least a few hours. This traditional Greek dish of various nightshade vegetables is typically baked but since our outdoor farm kitchen only has a double burner stovetop, we had to make do with 2 cast iron pans. It turned out to be just as delicious as the baked version and as fresh as could be with our own garden vegetables picked in the last 24 hours. 1. Slice the eggplant about ¼ -1/2 inch thick. Sprinkle with salt and let sit for 10 or so minutes. 2. Boil the potatoes whole until they are mostly cooked but still firm – probably around 20 minutes. 3. Start sautéing the eggplant in oil on the stovetop as soon as you have the space as it takes a while. Cook until slightly brown and soft. Note that the eggplant can be baked on a cookie sheet with olive oil for this step. · Slice and sauté the shallots in butter or oil, adding a little vinegar once they are browned to scrape off the tasty browning bits off the pan. Then add the chopped garlic and sauté for another minute. Add the ground beef or lamb and cook until the meat is mostly browned. · Boil the cubed tomatoes and herbs (a few tablespoons dry or 2-3 times that if fresh—more is better with herbs) on the stovetop stirring until a sauce is formed. Salt to taste and add a few teaspoons of sugar or honey if the sauce tastes too acidic. Often tomato sauce recipes call for skinned tomatoes but I like the skin and there seems to be no need to go through the work of removing it. Add the meat, shallots and garlic mixture. · Make a rue with about 2 T. browned butter. Add flour (I use gluten free) slowly until it forms crumbly dough. Cook for a few minutes on low, stirring constantly. · Then slowly add milk and continually stir until a creamy consistency is formed. 6. Finishing the potatoes – slice the potatoes about ¼ inch thick if possible and sauté in oil or butter in a large cast iron pan until slightly crispy (in the bottom of the pan you’d like to layer and finish the mousakka in). I crisp up one side and then flip them all at the same time, after which I start layering the eggplant and tomato sauce (putting it all together – see step 7). Note that the sliced potatoes can be baked on a cookie sheet with olive oil. 8. Cook on low for about 10 minutes with another cast iron pan on top to seal in the moisture and create an oven of sorts. Note that in this step the dish is typically baked. I “bake” this on the stovetop until I can tell the second side of the potatoes is browned and the sauces have bubbled a bit, indicating all of the layers have been cooked together creating a mouth-watering flavor infusion. A simple, light and savory meal or appetizer. Enjoy it by itself or with pasta or rice. I rarely eat at chain restaurants as I prefer the unique tastes from smaller, individual restaurants. However, I enjoyed a delicious mussel dish at Carrabba's Italian Restaurant thanks to a gift card, which inspired this recipe altered to be dairy-free. Again, many variations are possible so just use what you have. 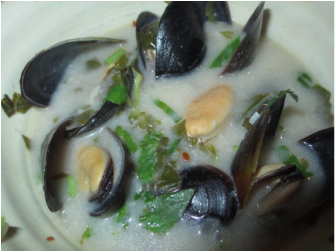 I also found a recipe claiming to be Carrabba's original recipe for "Cozze Bianco", so just click on the link to view that one (I haven't tried making it yet). Heat pan over medium. Add oil to pan, swirling to coat. Add shallots/onion and cook about 2 minutes or until tender, stirring frequently. Add garlic and cook another minute. Stir in coconut milk and next 7 ingredients (through chili flakes). Bring to a boil. Add mussels to pan. Cover and cook 5 minutes or until shells open. Discard any unopened shells. You may stope here and eat or continue step 2 for a more full sauce (I saw this in a different recipe by Laraine Perri in Cooking Light). Optional: Serve with Scallion rice: Combine 1 cup water, 1/2 cup jasmine rice, 1 teaspoon butter, 1/4 teaspoon kosher salt, and 1 thinly sliced green onion in a small saucepan; bring to a boil. Cover, reduce heat, and simmer 15 minutes; remove from heat. Let stand 5 minutes. Fluff with a fork. From my midwestern roots, this one dish meal makes a tasty leftover and also freezes well…a good dish to bring a new mother as it is nourishing, immune supportive and high in protein. It is adapted from a recipe by Jo Radke. 1 can of cream of mushroom/chicken soup (about 10 ounces). I always do make this homemade with a generous amount of sautéed onions (at least 1), garlic (2-10 cloves) and any type of sliced mushrooms (1-3 cups)…no cream is necessary – the dish tastes just as good without it. I sometimes use homemade bone broth from leftover chicken. 1 cup croutons (homemade: cut up bread into small squares…add a lot of seasonings like oregano, thyme, parsley, sage, basil, salt and pepper…sautee on stove top or bake in oven with butter or oil). 3. Set chicken on top of this mixture and top with swiss cheese and then remaining 1 cup of liquid that was previously set aside. 4. Cover and bake at 350 for an hour…note that this time will vary depend on the type of rice used…brown rice may take up to 2 hours. 5. Remove cover for final 20 minutes and add croutons…you may broil for 5 minutes at the end to brown the cheese/croutons. I love corned beef and cabbage so I decided to create an easy crock pot version of an Irish favorite, a perfect dish for St. Patrick’s day or any time of year. 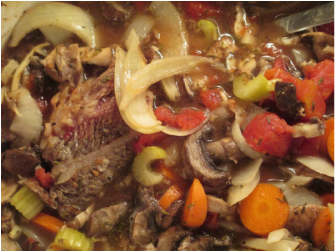 You can use a precooked corned beef brisket (or tips) or an uncooked one, just be mindful of which you have as it will determine when you add it to the crockpot. The measurements vary depending on what you’d like to emphasize. 1. 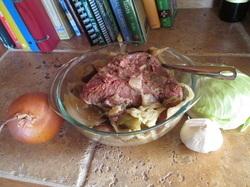 Place all ingredients including corned beef, if it is raw, in a medium crock pot. (if using precooked corned beef, leave it out for now to keep it tender). I usually put the meat as the top layer. Note that even if your beef came in basting juices with spices, I still like to add some more, especially if it is the precooked corned beef you’re adding towards the end. 2. Cook on high for 1-2 hours and then turn to low for 4 hours (or just cook on low for 5-7 hours). If you are able, you can “baste” the meat with the juices in the bottom twice. Note that each time you open the lid, it takes about 20 minutes to recreate the heat/stem in the crock pot. Or just baste at the end before serving if you aren’t home to do this. 3. If using precooked corned beef, add it on top of the rest of the ingredients for the last hour or two, basting it with some of the juices below when putting it in. 4. You shouldn’t need to salt before serving. Enjoy! Tender, savory and delicious. Many adaptations are possible, such as using a beef roast instead of the ribs. Also, you can use beef stock instead of just water. I think some red wine and potatoes would also make a good addition. 2-4 pounds short ribs (about 2 ribs is one pound) - you may brown these on the stove first. I use butter. 1-2 onions, chopped or sliced. I used a yellow onion. 2 Tablespoons vinegar. I used balsamic. 2 Tablespoons prepared mustard. I used Sun Valley's chardonnay mustard from Whole Foods. It is amazing and good in dressings or as a dip for sharp cheddar cheese. Some salt and fresh cracked pepper. Add more salt at the end to taste. 12 ounces of fresh crimini (brown) mushrooms, sliced. Any type will work. It's really easy. Just put everything in a slow cooker and add some filtered water, probably about a cup or so. Let it cook on high for 4-6 hours or on low for 8-12 hours. The more you open the lid, the more steam is released and the longer it will take to cook. Add more salt to taste at the end if you need to. This delicious recipe is an excellent blend of sweet and savory for dinner or an appetizer. It is best with a homemade simple curry sauce added on top of the chicken filling to keep things moist. Coat the almonds in honey if you would like to omit the powdered sugar. Be sure to add the cinnamon to the top after it comes out of the oven and not if you are freezing it for later, or the cinnamon will burn. 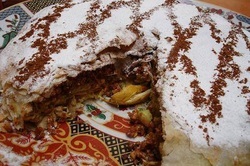 Chicken Bastilla is Morocco's famous chicken pie. A light, crispy warqa pastry shell conceals savory saffron chicken, spicy omelet stuffing, and crunchy topping offried almonds sweetened and flavored with orange flower water. A garnish of powdered sugar and cinnamon adds to the fabulous blend of flavors. This authentic recipe does take some time to prepare, but you'll find it well worth the effort. How to Make Chicken Bastilla shows how to assemble the bastilla. Make bastilla a day or more in advance, and refrigerate or freeze until baking time. Also try Seafood Bastilla. Makes one 12" bastilla. Serves 4. Brush butter on the folded edges of dough, and top with three more overlapping layers of warqa(shiny side up) or phyllo, brushing butter on each layer. Fold down the edges of dough and carefully tuck them underneath the pie, molding and shaping the bastilla as you go.